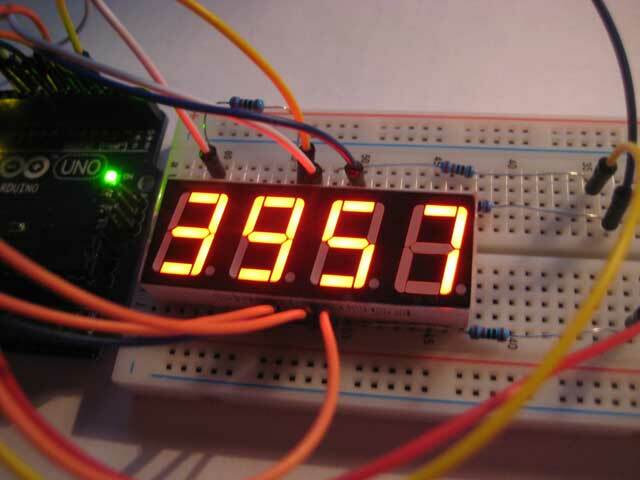 In this post I will show how to connect and drive 4-Digit 7-Segment LED Display with Ardino UNO. Recently I have posted a topic on how to drive a single 7-segment LED Display. I think it was simple, but it requires lots of wires. Usually we need to display numbers that consist of multiple digits. For this purpose it is possible to find 4-Digit 7-Segment LED Displays with Common Anode or Common Cathode in the market. The module contains four 7-segment LED numeric displays. These digits can be turned on and off independently. Each of the four digits in the module uses its own common cathode (or common anode) connection point. It means that every segment (line) shares the same anode (or cathode) connection points. Segments are labeled: A, B, C, D, E, F, G, H (for dot). Every segment is connected to all four digits. This reduces the wiring required (4+8=12 vs 4×8=32). There are 12 connection points = 4 PINs are used for digits + 8 PINs are used for segments (lines). The most important difference between 1-digit and 4-digit displays is the way we turn ON and OFF segments. To light multiple digits we use ‘multiplexing’. We display 4-digits at once by rapidly cycling through them in infinite loop. 1) Turn ON active digit by switching its PIN connected to common cathode (anode). 2) Determine the list of segments to turn ON and light these segments. 3) Wait for some time (2-5 ms). 4) Turn OFF the digit (cathode and all segments). 6) Select next digit in list [1…4]. Some people aware of too much current in the circuit when all the segments are switched on. The current will be 7 * 20mA = 140 mA, or 7 * 10 mA = 70 mA (depends on resistor value). This current is safe for Arduino, but will damage STM32 MCU (transistors can solve this problem). Segment DP or dot (pin 3) is not used in this sketch. Analog PINs A0-A3 can work in digital mode, so we use these pins to drive digits. These PINS will be used as common cathodes. The display is multiplexed, so we select the digit by setting its pin LOW (make it GND/cathode), and then we light segments by setting thier pins HIGH (anode). The sketch source code is available in this GitHub repository. This entry was posted in Firmware and tagged 7-segment, Arduino, display, LED. Bookmark the permalink.